Cyprus unfortunately is divided. However, being a foreigner, I am able to travel on either side of the island with little problem. The kids and I had decided that we would have a look at the Turkish side of Cyprus, seeing as I had worked for about four months on the Greek Cypriot side of the island and never crossed the green line. We got our gear together for the day (passport and cameras basically) and headed down to the Ledra Palace area in Lefkosia. Here there is a crossing point, allowing you to go over the green line and into the Turkish Cypriot side. After being warned about not supporting the economy on the other side of the island (“don’t buy anything, not even water, you cannot drink even the bottled water there”) we (me, Jenny and the Beaver) set out across the green-line to see some of the historical sites on the other side of the island. Well, it was like a scene from a John Wayne movie – sort of high noon – stepping across the green line – I will get around to describing it more fully one day. We crossed to the other side and there we were checked into Turkish Cyprus. We engaged a taxi driver who for about 30 or 40 Cypriot pounds (can’t remember the exact amount) would take us to wherever we wanted to go on the Turkish side and get us back to cross the green line by 5:00 pm, when we had to be back in Greek Cyprus by. We asked just for a general tour across to Kyrenia. He would have taken us to Famagusta if we wanted but we were happy with Kyrenia. The taxi ride was interesting in that the taxi had been imported from Turkey and was left-hand drive, but the Turkish Cypriot side of the island still drives on the left hand side of the road, same as the Greek side. Unnerving to say the least. The first thing our taxi driver did was to stop and buy bottle of water for the kids … so much for not buying stuff on the other side of green line. We drove along the main highway and about 20 minutes after leaving Lefkosia, we turned left and drove up a windy mountain road to the castle of St. Hilarion. 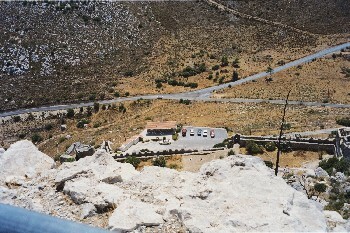 The area around where the castle was built was where a hermit, Saint Hilarion, had fled from persecution in the Holy Land. He lived in a cave in the area and the area bears his name. In the 10th century, the Byzantines built a church and a monastery in the area. A castle was built there as well as a response to a series of raids by Arab pirates from the 7th to 10th centuries alond the Cypriot and Anatolian coasts. 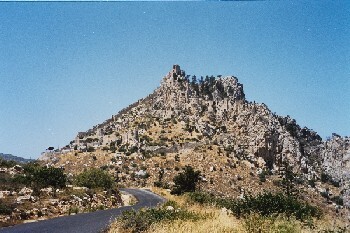 The castle was built as a watchtower (along with constructions at Girne, Kantara and Buffavento). From the top of the castle, o­n a clear day, you can see clear to the Taurus mountains and coasts of Anatolia. The castle became a summer retreat and place of refuge for the Lusignans when they held power. The Venetians captured Cyprus in 1489 and it was during the period of Venetian occupation that St Hilarion dropped into disuse. The Venetians relied on the line of Kyrenia, Lefkosia and Famagusta for the defence of the island. The castle itself runs up the mountain and is built at three levels (take water and plenty of breaks if walking around, the castle rises a lot – maybe 100 metres from bottom to top … maybe more). The first and lowest levels were built to accomodate the garrison and the horses. It started with a barbican. The main gate and other walls were reinforced by horseshoe shaped towers in the 11th century. This was by the Byzantines. There were water cisterns at this level as well and these, with the stables, have survived the ravages of time. The middle level consisted of a church, a Belvedere [a structure (as in a cupola or a summerhouse) designed to command a view], barrack rooms and four-storey royal apartments enclosed in a castle and entered over a drawbridge. The apse of the church survives. The refectory apparently served as a dining room for the Lusignan nobles is the largest room in the surviving ruins. The upper castle is a steep (bloody steep – sit and enjoy the view from the middle castle and let the kids walk to the top – especially if it is high summer), windy climb. You enter through an arch which has a tower protecting it. The courtyard to the upper castle rests between the twin peaks known in the original Greek as Didymos (twin). The Crusaders corrupted the Greek and the peaks were know as Dieu d’Amour. They stand 732 metres above sea level. There are two more cisterns in the upper castle and the castle itself was well suited to withstand sieges. as the Tower of Prince John. Early references to the castle are found in the contemporary accounts of Richard I of England (Lionheart). He campaigned o­n the island in 1191 and captured Isaac Comnenus after victory at Tremethousha. 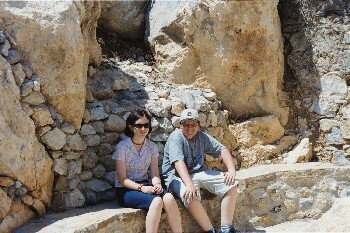 Richard assigned the task of taking the rest of Cyprus to Guy de Lusignan. Girne surrendered after a vrief attack but St Hilarion resisted until Isaac ordered its surrender. The Castle was organised for defense in 1228 when Hohenstaufen Emperor Frederick II, o­n his way to Palestine, landed at Limassol and demanded the regency of Cyprus. This demand was based in the fact that King Henry I was still in his minority and that the Lusignan had received the crown from the Enperor’s father, Henry VI, in 1197. Some unsuccessful discussions took place between John d’lbelin the Regent (and successor to the earlier regent Philip – his brother) and Frederick. The result was that d’lbelin retired to St Hilarion, which had been provisioned. d’lbelin eventually arranged a truce and he and the King went crusading. When they came back, Frederick’s supporters had taken over. d’lbelin defeated them near Lefkosia and they then holed themselves up in St Hilarion. After a nine-month siege, they surrendered. Enter Frederick again. Frederick sends a force of Langobards who overrun the island. The Imperialist’s invest St Hilarion where the King’s sister and his supporters are taking refuge. Henry returned from Syria about this time with an army which fell o­n the besieging forces and routed them at Agirdha – where the road from Lefkosia enters the Girne pass. The Langobard capitulated at Girne as well. Exit Frederick’s claims to Cyprus. The castle and the island were reasonably quiet for the next 140 years or so until the Genoese ravaged the island in 1373. They were supposedly avenging the death of a few compatriots during an incident at the coronation of Peter II. John, the Prince of Antioch, the Rgent and the uncle of the young King took refuge in St Hilarion. He also had with him a guard of Bulgarian mercenaries. These made effective sallies from St Hilarion against the Genoese besieging Girne Castle. When the King (Peter II) and his mother Eleanor had made peace with the Genoese, ceding the Genoese Gazimagosa, the Queen sought to avenge herself against Prince John for his part in the assassination of her husband, Peter I. She managed to persuade John that his Bulgarians were plotting against him so he summoned them to the top of the castle and had them all thrown off (bet that really showed him – I guess he was a bit unsettled in his own mind). Now defenseless, he left for Lefkosia and never returned. The Venetians took over the island in 1489 and dismantled St Hilarion at that time, relying instead o­n Kyrenia, Lefkosia and Famagusta for defence of the island.